As part of Enterprise Fortnight, Ballymena Area Chamber of Commerce and Industry and Danske Bank jointly hosted a Business Breakfast at Galgorm Resort and Spa. The event which focused on economic factors impacting on businesses attracted a large audience with over 90 members of the local business community attending. Chamber President Alderman Robin Cherry MBE welcomed the attendees and expressed Chamber’s commitment to providing events which supported local businesses. 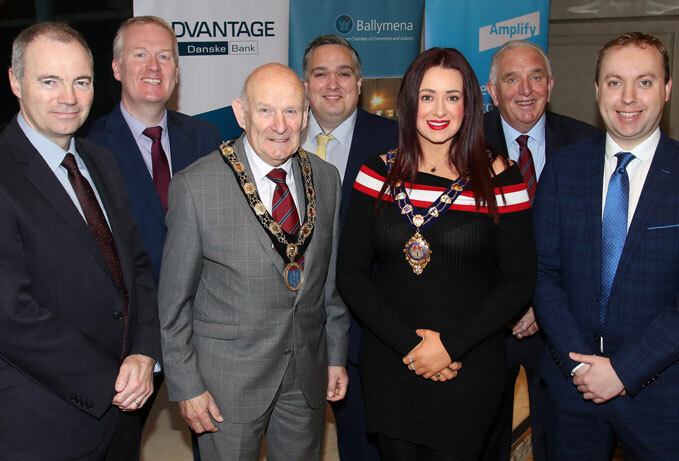 Councillor Lindsay Millar, Mayor of Mid and East Antrim Borough Council expressed her delight that the Chamber and Danske had collaborated to host such a timely event which would provide valuable information to those attending. The Mayor also reiterated Council’s commitment to supporting and sustaining the vibrant business community within the Borough underpinned by the Amplify Strategy. She believed the Council’s forward thinking approach would help secure inward investment and build on the strengths already evident in the local business community. Key speakers for the day were Conor Lambe, Chief Economist and Brian Telford, Head of Markets, Danske Bank. Their presentations focused to a large degree on the economic issues surrounding Brexit. Indeed, to say that the presentations were timely may have been an understatement as Conor and Brain were able to comment live on a number of key Ministerial resignations which occurred during the course of their presentations. Aaron Ennis, Northern Business Manager, Danske Bank facilitated a question and answer session at the conclusion of the presentations. It was clear from those attending that the inputs certainly generated a lot of debate and that attendees left the event with a much better understanding of the current economic situation and the challenges ahead. Chamber Business Development Manager, Tom Wiggins was delighted with the number of businesses who attended and that Danske Bank had offered to work with Chamber in providing such a current and timely event. Tom reiterated that Ballymena Chamber of Commerce are committed to assisting local businesses through a wide range of initiatives. The next Business Breakfast hosted by Chamber will be on Thursday 29th November in the Adair Arms Hotel and this will focus on ‘Increasing Sales Through the Use of Digital Media’.